This State Library of South Australia guide highlights resources available at the Library as well as various databases and websites that may assist your search for ancestors from Scandinavia. 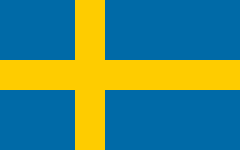 The information on this page concentrates on how to locate family history related records and information in Sweden. Searchable online database containing more than 3 millions records of Swedes who lived before 1911. Each record consists of info about name, parish and year for events such as birth, marriage and death and also includes the name of the submitter. The database is made up of information submitted by members of the Swedish Genealogical Computer Society (DIS Society). For a more general listing of Swedish related material within our collection click here.